How to Build An Online Following: The Definitive Guide for Health Coaches + Wellness Entrepreneurs! In this deep-dive blog post, we’re going to be looking at the TOOLS currently at your fingertips to build a loyal following of ideal clients and coaching prospects online — plus, I will explain WHY you need an online following, HOW to get one, and WHEN to start. To get clients, you must get in front of as many people as possible, and you must ask for the dance. This is the ONLY formula you need to focus on to build a thriving health coaching business. And it is those first two in particular - getting in front of your ideal clients (either ONLINE or OFFLINE) and “asking for the dance” - that are the MOST important things that you should be focussing on when you’re just getting started. Ask people if they'd like to explore working with you… invite them to a Discovery Chat… pitch your coaching services and offer your support… that is always your priority. It doesn’t matter how many people are already following you, you MUST always stay focused on asking for the dance. You might think it should be the other way around, but it's important to remember that asking for the dance is always necessary — and 99.99% of the time it is up to us to initiate! Then the final thing Priority #3 - which you need to focus on on a daily/weekly basis - is building your audience online. As a coach and entrepreneur, you need to grow an audience of people who want what you are offering - and who see you as an expert. Also, real quick! I wanted to let you know about a great FREE resource. It is my workbook that teaches you how to take actionable next steps in building your online following! Click the button below to get it instantly. WHY BUILD A FOLLOWING ONLINE? OK, I’m going to have fun with an analogy here. Building a following online is like creating your own pond of fresh fish (aka: prospects and ideal clients) which you can continually fish in. If you were just focusing on ‘in person’ marketing - so that top box in the diagram above - eventually, that pond might run dry. Say you've spoken in every place that you can, you’ve scoured your local area for clients, and you feel as if there’s a limit to the number of prospects out there at this stage. If you're going online, however, and starting to cultivate an online audience, that broadens your horizons hugely! The key is to continually build your pond of fresh fish. Keep cultivating your fish pond, growing your audience, increasing your following - filling it with new fish - and then there will never be a lack of clients. Building an online following is NOT a quick fix. It takes a LOT longer to build the “know, like, and trust” factor online than it does in person (which is what makes people buy from you). To build your online following, you need to start TODAY — even though the fruits of your labour might not show up until much later. I’ll say it again: this not a quick fix!! When you put up a post on Facebook, or you publish a blog online, it might look like that’s all that other people are doing - but in reality, they’ve been building their online audience for months, or even YEARS, before you knew they actually existed! Which is WHY they can put things online and they sell very quickly. Which is why they can get hundreds of likes on a single picture. Which is why they can create new offers in a day and sell out programs by posting just a couple of Instagram Story invites. They’ve built their audience and “know, like and trust” factor over time. So the moral of the story is - start building a following today. There will never be a perfect time. And I GUARANTEE you, in a couple of years, or a couple of months, or even a couple of weeks (!! )… you'll wish that you'd started earlier. It’s that important, and it does take time. This comes with a giant flashing word of warning, ladies. Getting bogged down in the technology, and spending hours trying to work things out. Not taking consistent action, and not asking for the dance. Really check that you're not falling into any of these traps!! Don’t spend hours on end perfecting your website, your blog, or your social media posts. It really is a great place to hide. A great place to stop you getting out in person, or asking for the dance. One of the biggest mistakes I see new coaches make is hiding behind technology. That is hands-down the biggest mistake and sets them up for failure. Don't forget to download your FREE workbook that teaches you how to take actionable next steps in building your online following! Click the button below to get it instantly. Your plan and focus should be always to get clients. Which is why you need to strike a balance between your time spent on building up the technology pieces — your website, your social media, your landing page, your newsletters — and getting out in front of people (yes, in person!). 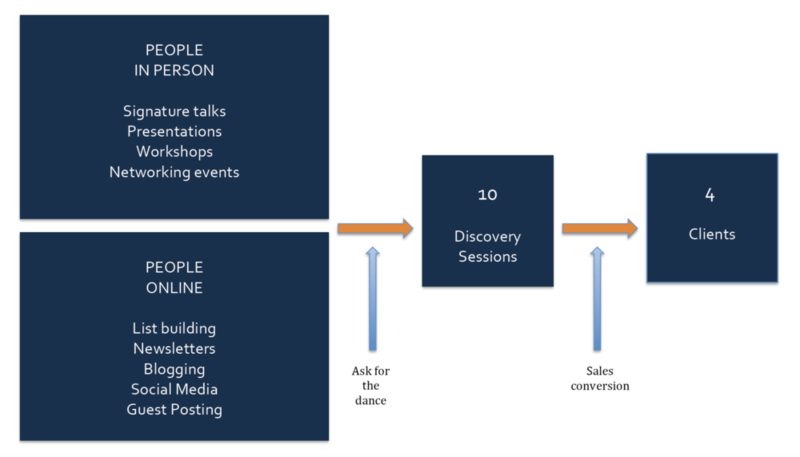 So if you are aiming for four clients a month, then 10 discovery sessions are likely to come first, and to book those discovery sessions you need to get in front of people — locally. In person, online, but through your current networks. (Go back to that diagram at the top of this post). Don’t wait till your instagram is at 10k or your website is perfect before you go out and get clients! So my big piece of advice is: Be really conscious of where you're spending your time. Check that you're not kidding yourself! Make a note each day of what you’re doing to work in your biz. You’ll quickly see if you’re spending all your time tinkering on your website, or re-writing a blog post 18 times before you hit publish. Now you know the 3 big mistakes you must avoid, how do you go about avoiding them? Outsourcing is a GREAT way to help prevent all 3 traps, and something to seriously consider as you grow your business and your following. As the business owner, it's great to have a basic understanding of all these tasks. I personally think it's very important that you write your own base copy, or create your own content to start with. These are all examples where you could get a professional to finish things off if it's not your strong suit, or do the design if you’re not that way inclined. If you’re interested in outsourcing, I made this video and blog post on how to work with a VA to save time and get more done in your business. I'd be hugely surprised if anybody reading this blog post hasn't been immersed in social media over the past few years. We all know what it is and use it personally in some way. But how can we use social media to grow our business?! Growing your expert status by sharing valuable advice and information through your social media content. As you can see, it’s a pretty incredible tool!! So to maximise that, it’s really important that you’re creating consistent content and that this content is speaking to your ideal clients and/or those who would want to engage in it. Not so fun fact: On your Facebook business pages, only 2% to 5% of your followers will actually see your posts. There ARE however things you can do like Facebook Ads or “boosting” a post for $5 which can get those posts seen by more people. And you can promote your FB Lives to your email list to let them know you’re going live at a certain time — so they can watch live or watch it later, but either way they know it’s there! Nowadays, I see your FB Business Page as a fancy business card. It's still expected that you should have one, and people will likely look it up and see what you're all about when they first come across you. It’s also a really great platform for live video (as I mentioned) — which is excellent for growing your ‘know, like and trust’ factor. In summary - it's important to have a presence on your page, but do be aware that with only a small reach per post (unless you pay for it, or actively promote it) - and it’s not necessarily the “be all and end all” of your social media strategy. WHAT SHOULD YOU POST ON YOUR FACEBOOK BUSINESS PAGE? You want to post nurturing content on your FB Business Page, not a lot of sales-y content. Think: 80% “give” - 20% “ask” for the buy. Remember: People are on social media to socialise, or to get that “fun” hit. They're not there to be sold to constantly. YES you can absolutely offer discovery sessions, and talk about your programs — but have a smaller proportion of posts like that. Overall you want to be nurturing and building engagement and connection with your followers so that you can build that “know, like, and trust” factor that sells so well, and helps convert prospects to clients. You can change the cover image to promote whatever you want — right now mine is marketing my FB group and my website BUT during a launch I have fresh cover images made to promote my UPswing Mastermind, webinars, and challenges. The other thing you can do on Facebook to build your online audience is create a Facebook Group!! I recommend you start with a Facebook Business Page first because that is your “business card” on social media. But closed Facebook groups are great too and they're more intimate. Facebook groups are great for conversation, and very different to a Facebook Page, which is only serving up your content to a very small percentage of your followers (unless you pay for it to be boosted or run ads). I also host FB Lives in the group - which is a really powerful and fun way to connect with and share valuable content with your audience. Instagram is absolutely amazing for Health Coaches and Wellness Entrepreneurs — because it is so visual. As with all marketing, think about the experience you’d want to have on Instagram if you go in there as a follower yourself and the kind of content you're hanging out in the app for. Instagram is really good for building your “know, like, and trust” factor because it's got that real personal feeling. It's great for sharing “behind the scenes” moments. If Instagram is where you think your ideal clients are hanging out, and you love taking photos, that might be the platform you want to concentrate on. In that case, since you’re already creating content on there, just hit the button to share your post to your Facebook Business Page and you’re servicing another platforms with no extra work. With Instagram you can sprinkle in some personal and professional branding as well. For example, on my instagram, I’ve got a combination of “behind the scenes,” some tips and inspiration, the occasional branded sales graphic encouraging people to check out my video training series or a program I am offering; then other times just a beautiful flower, a delicious meal, the view from my desk, and photos from my travels or around my home. It gives people a taste of your personal brand and who you are — and if you always use the same filter, and sprinkle branded graphics, it gives a taste of your professional brand too. Pinterest is used to collect, share, and organize photos, articles or content relevant to your business - and it is more of a search engine than a social media platform. On your Pinterest account, you could be pinning things like healthy recipes, food, health infographics, relevant articles… Anything that you think that your audience and potential clients would be searching for, or find interesting and useful. You can also create a board for YOUR website or brand, and pin your blog posts there - as long as you create a Pinterest-ready graphic (as I do on my blog) - this is a fantastic way to drive traffic to your website. I’m condensing ALL video platforms here, but there are so many to choose from nowadays, including: YouTube, Instagram Stories, Facebook Live, Instagram Live, Snapchat. Videos are such a great way to build the “know, like, and trust” factor with people. Did you know that video itself can increase conversion rate by 80%?! They're SUCH a popular way to communicate with and attract your ideal audience, as people like to see you. It’s one thing to hear you talk, or read something you’ve written, but when they get to see you as a person it just boosts that connection tenfold. But like all marketing it does come down to being aware of your audience. Do they watch videos? Do they want to watch videos? How do they consume them? This is a great thing to survey your ideal clients on, or just take note to see what your peers and competitors are doing. YouTube takes more work than Instagram Stories/Live and Facebook Lives, because YOU have to do all the editing — whereas the others have fun filters and are more casual and “impromptu.” Choose whichever platform is best for you and your ideal clients. Let's quickly talk about social media management. There is no way that anyone should be sitting on social media all day every day, in real time, uploading their posts. That will not last long at all I assure you!! And there is no need to get overwhelmed. Use social media to reach clients globally. Create awareness and visibility around your business, your products, your services. Choose the platforms that work for you and your target market. Consider using scheduling tools to keep your social media effective and efficient. Choose one to two platforms to start with and get consistent with those first. WHAT ABOUT BUILDING A WEBSITE? Now, I want to be very clear here: You CAN get clients without a website. One of the mistakes that I see is people going off and spending months making websites, and not doing anything else in the meantime. You think it'll be quick to put together a website, but by the time you go back and forth on colours and logos and branding and photos and copy-writing and all these things, it will take months to make it live and get it finished!! You CAN do that without a website. Create a PDF that outlines your coaching program, which you can share with people who are interested. Promote your services online. Get in front of people in person. If you want a website, go for it - but PLEASE, always make sure that getting clients is your priority. Last chance to download your FREE workbook that teaches you how to take actionable next steps in building your online following! Click the button below to get it today. One thing you DO want - even before a website! - is a landing page promoting a free opt-in gift that people can sign up to receive - which will help build your email list (more on this next!). Then as you build your list, you can then send them weekly blog posts in the form of newsletters, you can promote your coaching services, and stay in touch. LAST BUT NOT LEAST… LIST-BUILDING!! What is list-building, and why does it matter? Your ‘list’ is a list of names and email addresses that you collect of people who ‘opt-in’. So keep focused on growing your list and make it something you focus on every week. Let's say you set yourself a goal of 25 new names on your email list a week. That 25 people a week would become 100 new subscribers a month. You can see how over 12 months, that could be over 1,200 people that you have on your list. Whereas many people will go months and months, thinking they'll get to growing their email list eventually… but then 12 months later they're still at 0 or 20. We all start with our Mum and Dad and friends on our email list — who (probably) don't really want to follow us, or we don’t really want to work with. But the truth is we ALL have to start somewhere and we all DID start somewhere! So start building your email list NOW. The “right time” will never come. The right time is really 5 years ago for EVERYONE, because the bigger the list, the more reach you have, and when you want to sell things like online programs and products, you will need the bigger list numbers to be able to do that. So list build, list build, list build. Asking for the dance is your always your biggest priority, but list building is your next most important action-step. An opt-in gift is a piece of content that your dream client will be super happy to get their hands on. This is how you give value for their email address. You give away this piece of content for free in exchange for their name and email address. You want to promote these opt-in gifts anywhere online, not just on a website. Definitely on your social media channels, through FB ads (only if it’s in your budget), and if you guest post or are interviewed in a podcast. Work hard to get people to sign up for it - and always emphasise the benefits of signing up (eg: what they will receive!). That, my friend, is how you build your list. People want something for free!! They want something of high value. People don't just want useless freebies, they want something that is really valuable and this is where your work on understanding your target market is so important and purposeful packaging is really important. You can also capture names and email addresses in person, at workshops or networking events. You might not be giving them a free gift — but bear in mind this list-building stuff isn't just for online, it's for ANY ideal client you meet — and in any case, if they were a strong prospect, you would ideally be capturing their name and email address. When you introduce products and programs, your list will greatly impact your success. Products and programs don't really sell to a small audience, so growing your list is going to be key to having success with these things later down the track. WHY LIST BUILDING OVER SOCIAL MEDIA? Your email list is your #1 asset because you OWN it. If you build a big following on Instagram, or Facebook, or any of those social media platforms - you’re a little vulnerable. If they close, or if the algorithm changes, then you've potentially lost your business! Your newsletter list is also the only channel it is totally acceptable to sell from, and totally expected to be sold to! Selling on social media channels is okay in small amounts — and when done in certain ways - but it can feel sleazy if it’s done too much. People are often hanging out on social media to socialise… whereas a newsletter is a place where someone has put up their hand and asked to hear more from you. So it’s a little more acceptable to be selling via your email list. Remember though: Your newsletters should be a combination of nurturing and selling. Not just one or the other. Think of list building as building a tribe of people that you'd like to nurture — and even though I said it's about ‘size’, please don't get too hung up on that. It doesn't matter if you've got 2 people, 200, 2,000, 200,000. Build your own little family and treat them with respect and love. Nurture those that you do have in your community. So many people can get worried that they don't have enough… There aren't enough clients, there aren't enough people on my list, there aren’t enough people on my Instagram, I don’t have enough FB followers. Really focus on the followers you DO have, and even if there are only 50 or 200 people on there, and treat them like gold. Nurture them like crazy. By consistently nurturing your list, it will build, and you will have a loyal and engaged community — not a detached and uninterested one. Get in front of people that you know in your current local and online communities, but keep the focus on list-building on the side, because it WILL have a big impact over time. Once you’ve digested all this information, check out the following blog posts.